Countdown clocks are holding at the T-4 minute mark. Weather is “go” and winds are cooperating as well. There are no technical issues in work. 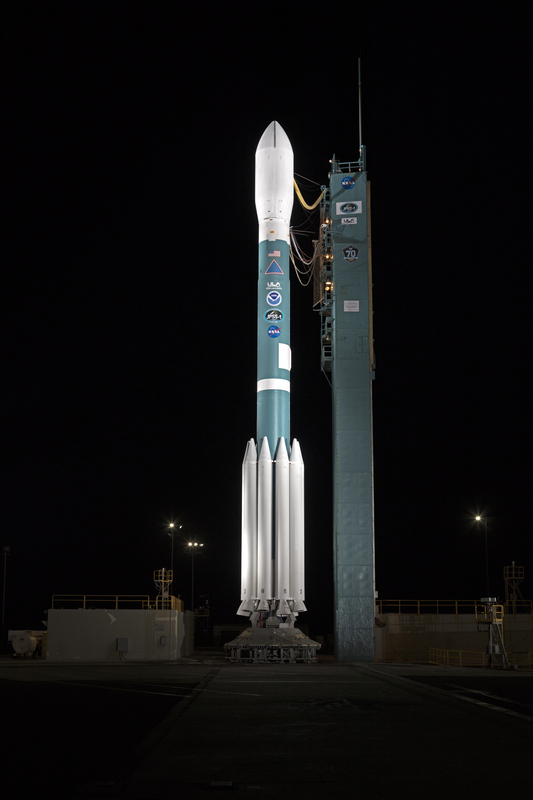 The countdown is expected to resume at 1:43 a.m. PST, leading to a 1:47:36 a.m. liftoff of the Delta II carrying NOAA’s JPSS-1 satellite. There will be one more built-in hold at T-4 minutes, and launch management will take that opportunity to verify the Delta II rocket, JPSS-1 spacecraft and all other necessary assets are ready for launch. 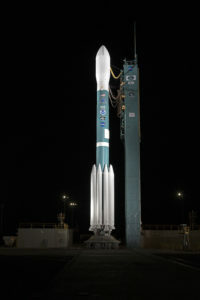 The countdown will resume at 1:43 a.m. At 1:47 a.m., the Delta II rocket’s main engine and six of its nine solid rocket motors will ignite, and JPSS-1 will be on its way into polar orbit. Watch for a chain of events starting at about 4 minutes, 20 seconds after liftoff: the main engine will cut off (MECO), the first and second stages will separate, the rocket’s second-stage engine will start its first burn, then the payload fairing will separate and fall away. The entire sequence takes less than 20 seconds. The second-stage engine cuts off (SECO 1) about 10-and-a-half minutes into the flight, starting a coast phase lasting approximately 40 minutes. At the end of the coast phase, the engine ignites again for a short burn — less than half a minute — with JPSS-1 spacecraft separation expected 57 minutes after liftoff. An additional quick engine burn then will be followed by deployment of the CubeSats. The countdown has resumed and clocks are ticking down from the T-15 minute mark. There will be one more built-in hold at T-4 minutes. At that point, the clocks will pause for 10 minutes. Launch Weather Officer Capt. Ross Malugani just briefed the launch team on weather and wind conditions. Weather is 100 percent “go” with no areas of concern, and upper-level winds are trending favorably at this point. Managers and controllers with United Launch Alliance, NASA and the Western Range will continue to monitor and assess conditions through the remainder of the countdown. The launch time has been adjusted to 1:47:36 a.m. PST, right in the middle of today’s 66-second launch window. 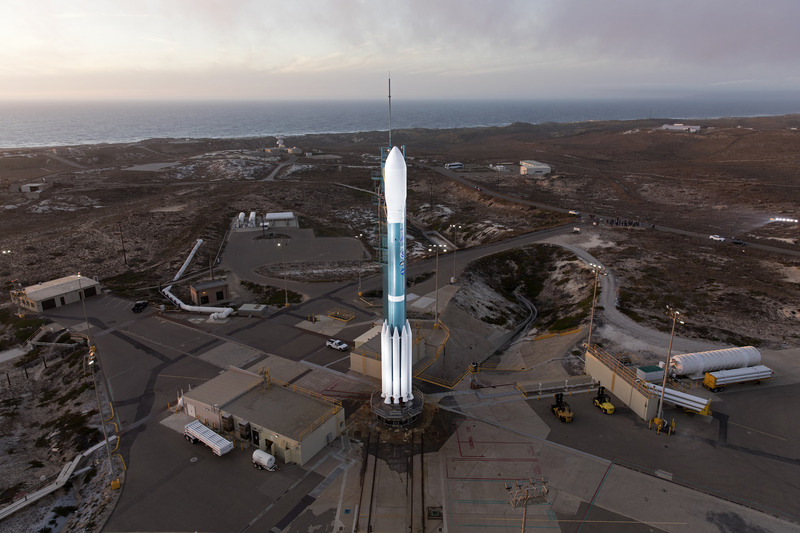 At Vandenberg Air Force Base in California, United Launch Alliance Delta II rocket is set to launch NOAA’s Joint Polar Satellite System-1 (JPSS-1) spacecraft. Liftoff is scheduled for 1:47 a.m. PST (4:47 a.m. EST) from Space Launch Complex 2. 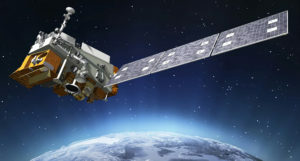 The satellite is the first in NOAA’s series of four, next-generation operational environmental satellites representing major advancements in observations used for severe weather prediction and environmental monitoring. Countdown clocks are temporarily paused for a planned hold at T-15 minutes. 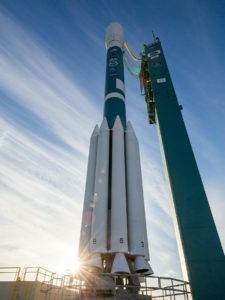 The Delta II rocket is loaded with its propellants – cryogenic liquid oxygen and a rocket-grade kerosene called RP-1 – and the vehicle’s second- and first-stage engines have completed steering tests. Coming up in the next few minutes, the countdown will resume and the 30th Weather Squadron’s Capt. Ross Malugani, today’s launch weather officer, will give the launch team an update. Weather conditions are expected to be favorable, and weather balloon data is trending favorably, indicating winds within limits. JPSS-1 and ELaNa XIV will be boosted into orbit by the United Launch Alliance Delta II rocket. This Delta II is a 7920 configuration, meaning a two-stage rocket topped by a 10-foot-diameter fairing. The booster stage will get an assist from nine solid rocket motors during the first phase of launch; six of the boosters will ignite at T-0 and the other three are “air-lit,” meaning they’ll start their burn after flight is underway. Today’s launch will be the 154th launch for the Delta II, and NASA’s 53rd mission relying on the rocket for a ride into space. 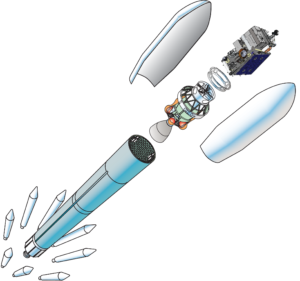 The Delta II sent NASA’s Spirit and Opportunity rovers to Mars and also launched missions such as Aquarius, Kepler and Suomi NPP, the first satellite in the JPSS series. NOAA’s Joint Polar Satellite System-1 spacecraft is set to launch this morning on a United Launch Alliance Delta II rocket from Space Launch Complex 2 at California’s Vandenberg Air Force Base. 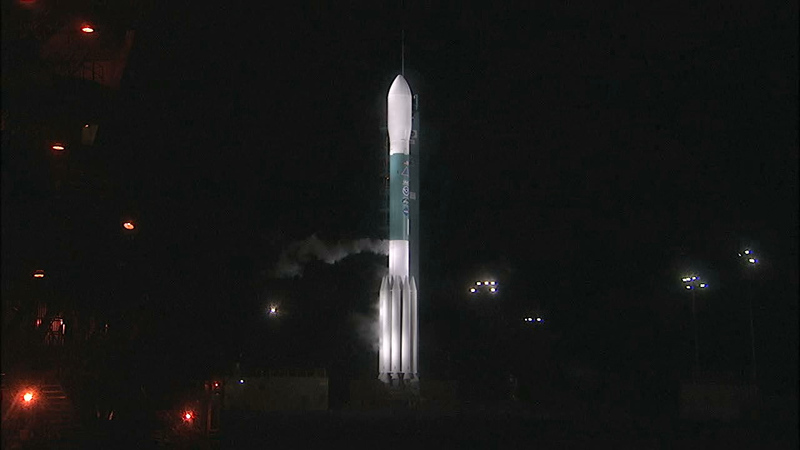 Liftoff time is 1:47 a.m. PST (4:47 a.m. EST). Join us for updates from the countdown beginning at 1:15 a.m. on the blog and on NASA TV. The JPSS program is a partnership between NOAA and NASA that will oversee all the satellites in the JPSS series. NOAA funds and manages the program, operations and data products. NASA develops and builds the instruments, spacecraft and ground system and launches the satellites for NOAA. 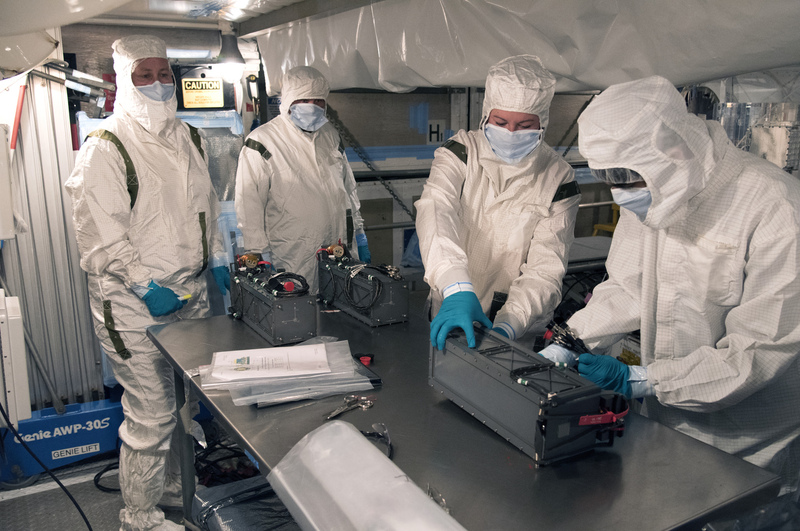 Although JPSS-1 is the primary payload heading into space today, it will be accompanied by four small satellite missions called CubeSats, part of NASA’s Educational Launch of Nanosatellites program. They’ll be deployed from Poly Picosatellite Orbital Deployers, or P-PODs, after JPSS-1 is successfully released. The P-PODs are mounted to the second stage. 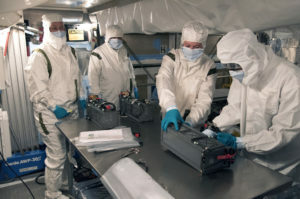 RadFxSat – Vanderbilt University, Nashville, Tenn.
EagleSat – Embry-Riddle Aeronautical University, Prescott, Ariz.
MiRaTA – Massachusetts Institute of Technology, Cambridge, Mass. NOAA’s Joint Polar Satellite System-1 spacecraft will launch aboard a United Launch Alliance Delta II rocket from Space Launch Complex 2 at California’s Vandenberg Air Force Base. Launch managers are working to determine a launch date after today’s planned liftoff was scrubbed due to upper-level winds. Visit https://www.nesdis.noaa.gov/jpss-1 or follow https://twitter.com/noaasatellites and https://twitter.com/nasa for launch status updates. Today’s planned launch of NOAA’s JPSS-1 satellite on a United Launch Alliance Delta II rocket has been scrubbed due to upper-level winds. The T-15 minute hold has been released and the countdown has resumed. 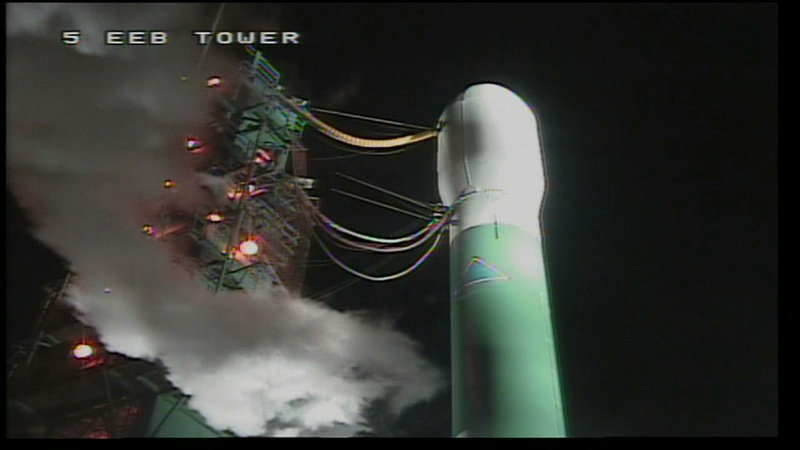 There’s one more built-in hold coming up at the T-4 minute mark. Launch Weather Officer Capt. Ross Malugani is reporting a 100 percent chance of “go” weather conditions at the ground level. The team is closely watching upper-level winds.